This online document might be outdated. 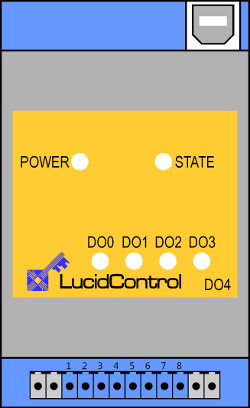 Please see the LucidControl USB Digital Output Module PDF documentation instead. 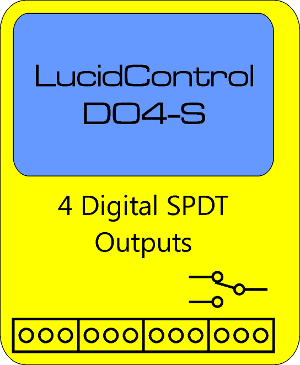 The figure shows the LucidControl USB Digital Output Module with 4 digital outputs (DO0 ~ DO3). All LucidControl USB IO modules have two connectors, the USB-Connector and the IO-Connector. Because of this the modules are very easy to connect and to setup. In order to fit most applications three different configurations of the DO4 module are available which are described in the following. The figure shows the DO4-I module which is recommended for standard applicatons. The versatile module can control lamps as well as pumps and it can be used to generate general purpose opto-insulated and potential-free digital outputs. The emploied solid state relays (SSR) are perfect to generate pulse-width-modulation (PWM) which allows e.g. controlling the power of a pump by switching power on and off periodically. Despite to mechanical relays SSR are not limited in switching cycles and are suited for periodical switching as well as for static switching. A detailed description of solid state relay outputs can be found in DO4-I (Solid State Relays Outputs). While DO4-I modules are preferable for many applications because of their opto-insulation they are limited in switching timing. The DO4-O module is similar to the DO4-I module but uses transistors instead of solid state relays which allow faster switching cycle times. 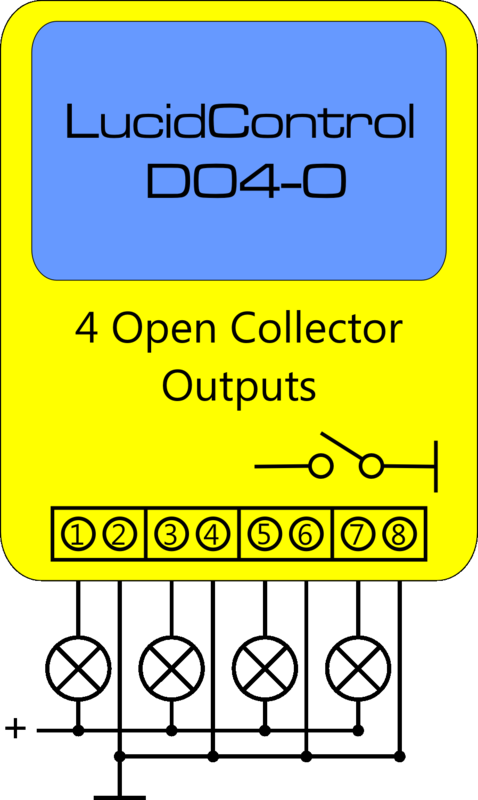 A detailed description of open-collector outputs can be found in DO4-O (Open Collector Outputs). The DO4-S module uses 4 mechanical “single pole double throw” (SPDT) relays. This relays have the advantage of behaving like mechanical switches closing a circuit. This allows not only switching of electrical power but also switching of measurement signals e.g. from a temperature sensor which would be distorted by using solid state relays. An additional advantage of the DO4-S module is that it can toggle between two signals. The DO4-S module should not be considered for periodical switching (e.g. PWM) since the relays are limited in number of switching cycles. Because of this the DO4-S module does not support Duty-Cycle Mode. A detailed description of SPDT outputs can be found in DO4-S (SPDT Relay Switch Outputs). Fig. 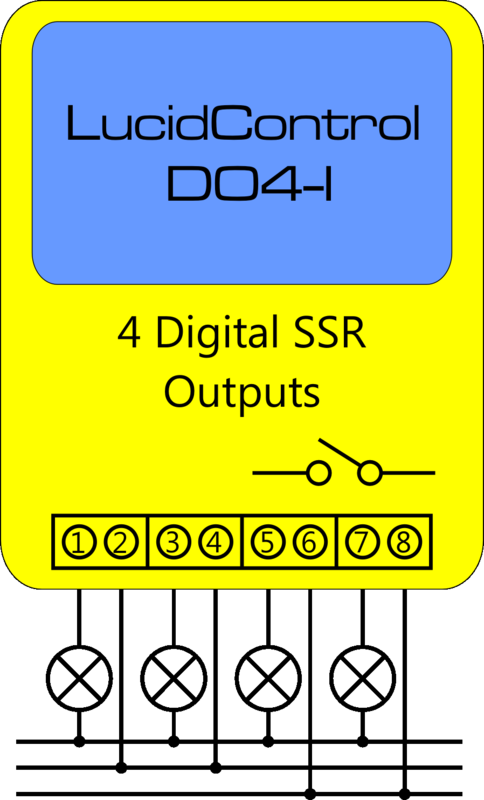 2.2.2.1-1 shows the connection of the first of the four solid state relay (SSR) outputs as they are used in the DO4-I module. When the output is activated the SSR connects terminal 1 with terminal 2, closing the circuit and switching the lamp in the depicted application on. For the DO4-I module the polarity of the signal does not play a role. The positive polarity can be connected to either terminal 1 or terminal 2. One characteristic of the SSR output is the opto-insulation protecting the electronic behind the SSR (e.g. the host computer). Moreover the outputs are potential-free i.e. the terminals 1 and 2 are not related to the terminals of any other output. The outputs connected to the terminals 3/4, 5/6 and 7/8 are identical to 1/2 and each is able to switch 0,75A / 30V DC. The outputs are not protected against overcurrent. It must be ensured that the current does not extend ISSRMax. Otherwise the output may be damaged. The DO4-I module supports the Reflect Mode, Duty-Cycle Mode and On-Off Mode. For Duty-Cycle and On-Off Modes the minimum on and off times are limited to TSSRMin. Fig. 2.2.2.2-1 shows the connection of the first of the four open collector (OC) outputs of the DO4-O module. When the output is activated the transistor connects terminal 1 with ground and switches the lamp of this application on. The outputs are not opto-isolated and not potential-free and it is important that the positive polarity is connected to the terminals 1, 3, 5 or 7. The terminals 2, 4, 6 and 8 are internally connected to ground which means that all Outputs are connected to the same ground namely the ground of the host computer. Due to this characteristic it is possible to switch the outputs much faster on and off. The principal of open collector outputs is shown in Fig. 2.2.2.2-2. While solid state relays create a connection between two terminals of the IO-Connector (e.g. 1 and 2) an open collector output connects one terminal (e.g. 1) to ground. In this application an external power supply VCC and an external load are connected to terminal 1 and 2 of an output. The negative Terminal of the power supply VCC must be connected to the terminal 2 (resp. 4, 6 or 8) of the DO4-O module. The load must be connected to terminal 1 (resp. 3, 5 or 7) of the DO4-O module. If the physical output is set, the transistor is switched on, connecting terminal 1 to ground. The biggest advantage of Open Collector outputs is the very fast switching time. DO4-O modules are best suited for applications where fast switching is required e.g. switching or dimming of lamps especially LEDs with PWM cycles of 100 Hz or faster. As Fig. 2.2.2.2-2 shows the output is not floating, but it is connected to internal ground. In contrast to solid state relays it must be considered that there is one common ground for all outputs. The output is not protected against overcurrent. It must be ensured that the current does not extend IOCMax. Otherwise the output may be damaged. The output is not protected against wrong polarization of the input voltages. Connecting a negative voltage to a positive output pin may damage the output. The DO4-O module supports the Reflect Mode, Duty-Cycle Mode and On-Off Mode. For Duty-Cycle and On-Off Modes the minimum on and off times are limited to TOCMin. Fig. 2.2.2.3-1 shows the connection of the first of the four single pole rouble throw (SPDT) relay outputs with its terminals 1, 2 and 3. The DO4-S module has 12 IO terminals instead of 8. 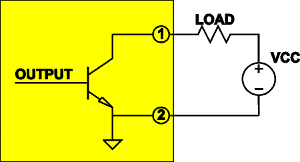 In the example the common contact “C” can be toggled between two resistors. While the output is deactivated the contact “C” is connected to the contact “NC” (Normally Close). When the output is activated the Contact “C” is connected to the contact “NO” (Normally Open). The terminals 1/4/7/10, 2/5/8/11 and 3/6/9/12 are identical. All outputs of the DO4-S modules are galvanically-insulated and potential-insulated and therefore can be seen as separate units without interference. The polarity can be disregarded i.e. it does not play a role which IO is connected to positive or negative polarity. 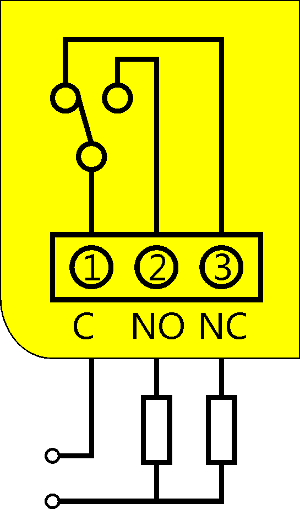 If an output is cleared it disconnects the C contact from the NO contact and connects it with the NC contact. This behavior is called “single pole double throw” (SPDT) and allows the selection of two different signals (toggling). Fig. 2.1.3-1 shows that the IO-Connector of the module has not 8 but 12 terminals. The output is not protected against overcurrent. It must be ensured that the current does not extend ISPDTMax. Otherwise the output may be damaged. The DO4-S module supports the Reflect Mode and On-Off Mode only. Because of limited number of switching Duty-Cycle Mode is not supported. For On-Off Mode the minimum on and off times are limited to TSSRMin.